This is a truly indulgent smorgasbord that marries two delicious dishes together. Hot dogs – check. Melted Cheese – check. 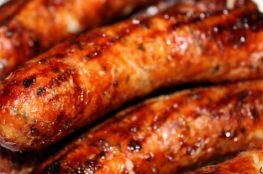 The buttery crisp bun and juicy grilled sausage make for a mouth-watering update and anyone who prefers a hot dog from the barbie will enjoy this. And you can take them up a fancy notch by using Gruyère and caramelised onions or provolone cheese and peppers. These are great anytime of year, comforting in the winter months but also a big hit in the summer when you have a crowd to please. 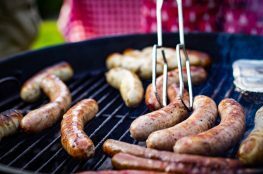 Why not invite your closest mates round and get grilling, though be warned you won’t want to go back to ordinary hot dogs again. Serve with your favourite condiments, ketchup and mustard as standard but a sweet chilli sauce would be delicious. Flatten hot dog buns with a rolling pin. In a small bowl, stir together butter, garlic powder, and onion powder. Spread all over outsides of buns. In a large skillet over medium heat, sear hot dogs (working in batches if necessary) until charred, 2 minutes per side. Set aside. Or pop them straight on the hot grills. Place a bun buttered-side down in skillet and top with ¼ of the cheddar cheese, a hot dog, a little more cheddar cheese, and ¼ of spring onions. Cover and cook over medium heat until cheese melts, then use a spatula to close the bun. Repeat with remaining ingredients to make 4 cheese dogs total.